Another pareidolia? More than likely. 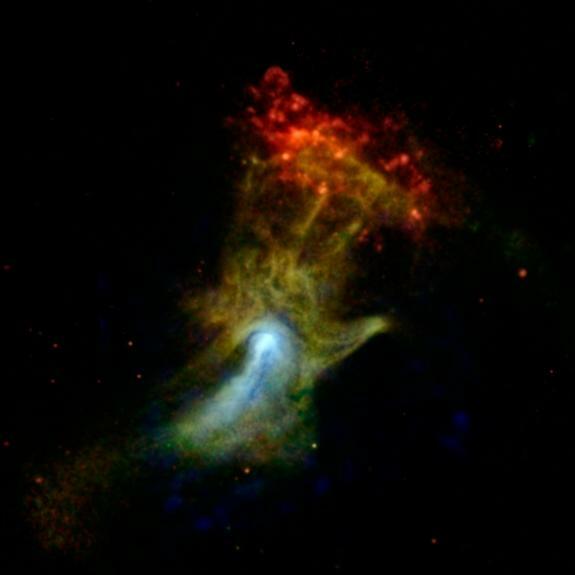 The author of this article quips the photo resembles the “hand of God.” This image was taken by a NASA space telescope and is of the remnants of a supernova. The image is too abstract to believe it is actually a hand. I can also see a side view of a goatman looking to the left. Is that Satan? Placing value in the “images” of Mary in grilled cheese sandwiches, the “shape” of a cross in someone’s cheesecake makes Christianity look ridiculous. God created an orderly universe. He created us to be orderly. Randomness is chaos. We tend to want to find meaning in randomness. When someone sees a random pattern (I know that’s an oxymoron. You know what I mean. Work with me here.) that abstractly resembles something he holds dear, he tends to impute meaning into the randomness. The object has value when it has meaning. The trouble is in the interpretation. The abstract image kind of looks like what we think Mary looks like. Then our brains take over and fill in the missing parts and we definitely see Mary in it. We then hold it so dear that we sell it for $28,000. (It was such a spiritual moment when I first saw it. That image of Mary on my grilled cheese sandwich spoke to me. She said “Start the bidding at $20,000.”) We have no reference point to determine if the image on the grilled cheese sandwich actually looks like Mary because we simply do not know what Mary looks like. So anything could resemble Mary. Who can argue with Diana Duyser? “I would like all people to know that I do believe that this is the Virgin Mary Mother of God.” The mother of God is a grilled cheese sandwich? Shameful ignorance. 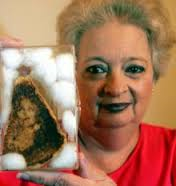 Ok, I know what she meant, the image of Mary the mother of God is ON the grilled cheese sandwich and it looks like the pictures of Mary she carries in her wallet. Sigh. The Gospel of Christ is mocked enough for the truth it declares. We really do not need to give people excuses to mock it for our ignorance. So, I do not believe the supernova is the “hand of God” but I do believe God’s unseen hand is in the supernova. Instead of trying to find meaning in abstract randomness, we should search for meaning in the concrete Word of God that is unmistakable. This entry was posted in Meaning on January 9, 2014 by DogTags.